John Safer has had a unique career. An internationally renowned sculptor throughout the latter half of the twentieth century, Safer at the same time was a successful entrepreneur who went on to become a major figure in banking. In the field of art, the New York Times compared Safer’s position as a sculptor to that of Georgia O’Keeffe as a painter and Ansel Adams as a photographer. 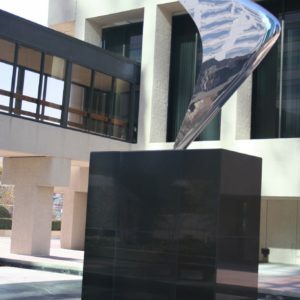 The U. S. Department of State sent John Safer sculptures abroad to be exhibited as an example of America’s finest art. His works today stand in private collections and public sites and have been exhibited in museums, galleries and embassies throughout the world. Ascent, a 75 foot high work, described as one of the great public sculptures of our time, stands at the entrance of the Smithsonian Institution’s National Air and Space Museum at Dulles Airport. 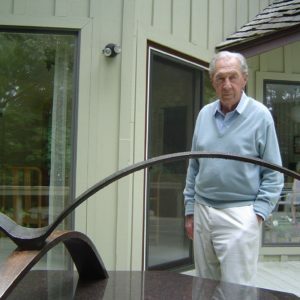 Well past his eighties, Safer continues to create sculpture. He works with his stepdaughter Kathryn Scott, to whom he taught his trade and offered his mantle. In 2007 they collaborated with architects to create a 35 foot high sculpture, Quest, for the Johns Hopkins Medicine Wilmer Eye Institute. In 2008, they produced a monumental work for General Dynamics headquarters. Over the next ten years Safer and Scott continued to work together on private and public projects. In 2016 they completed an 11 foot high mirror finished, Interplay, for the lobby of the LEED wing of the $340M Kimmel Cancer Center expansion at Sibley Hospital in Washington. In 2014 Scott began negotiations with MGM Resorts International for a centerpiece at MGM National Harbor in Maryland. The 60 foot high stainless steel sculpture, Unity, weighing eighteen thousand pounds and unprecedented in its scale, was installed at the entrance of the MGM hotel two years later — one month before the December 2016 opening of the $1.4B resort.